Big Betting Wins For Britain – And More To Come! For the first time we brought UK lottery fans the chance to win a £1 billion jackpot. Although nobody was lucky enough to win the big prize on America's record-breaking PowerBall jackpot we did have plenty of big winners at Lottoland – including two big winners from the UK. Americans never do anything in small measures, and their lotteries are certainly no exception. Earlier this month we had a prime example. While the media made a big deal of the UK Lotto's £66 million record jackpot the Americans decided to show us how it's done – blowing the lotto out of the water with a PowerBall jackpot of over £1 billion! Until recently UK lotto lovers could only look in awe (and a little jealousy too) at the huge amounts of money being won by their American cousins. So we changed the game. Now you too, can participate, by betting on the results online and win the exact same money as you would if you were to play in the States. We may not have had a jackpot winner, but we did have the next best thing – a second tier PowerBall winner who was one number shy of the record breaking jackpot. The winner, from Germany, scooped the equivalent of $2 million by using the PowerPlay feature, which multiplies non-jackpot wins – in the case of this draw, by two. 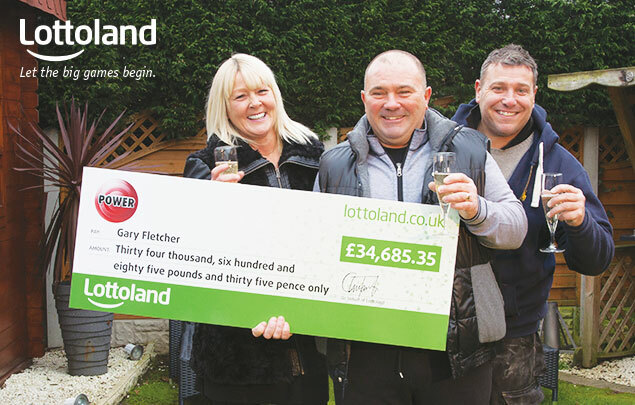 Meanwhile, in Sheffield, lifelong lottery player Gary Fletcher (pictured above celebrating with his family) was stunned by the revelation that his Lottoland account was now showing a win of £34,000. Shortly after the call came though – it was official, Gary Fletcher was a PowerBall winner. "I was astounded", he told us, "it was my first time playing PowerBall. I've spent years and years playing the UK lottery and only won a couple of tenners!" Twenty pound versus 34 grand – quite a difference to be sure, though understandably he's still a little miffed at being a number shy of a bigger win. "I chose the numbers based on those belonging to the houses I've lived at. I just wish I had lived somewhere with the door number 20! Still, I’m delighted. The year has got off to a fantastic start. We haven't fully decided what we will do with the money yet, but we'll probably have a bit of a party, spend a bit on the house and have a holiday." Shortly after we caught up with Gary and his friends and family for the cheque ceremony, photo shoot and, of course, the well-earned champagne. "It has been a fantastic experience and all the members of the Lottoland team have been great." While we were celebrating the news of Gary's big win we shortly received news of yet another PowerBall winner, Geoff Walker from Leicester, who, betting on the results of the following PowerBall draw, also won £34,000. So not just one, but two big UK wins to kick off 2016! Remember at Lottoland we bring you all the best lotteries from around the world, including a PowerBall jackpot worth £53 million and fellow American lottery MegaMillions with a jackpot of £39 million – both coming up this weekend.